Go above and beyond ordinary storage racks and dull concrete floors. Garage and Home Transformations can give your home the storage systems and concrete flooring enhancements you’ve always dreamed of. Garage cabinets and wall storage – providing storage organization systems to optimize space with smart, affordable solutions that are customized to meet your unique needs. Concrete resurfacing – offering sealers, coatings, textures, overlays dyes and stains to transform your indoor or outdoor concrete from dull to decorative. Whether you’re a home owner, business owner, contractor, designer or architect, we offer limitless options to bring new life to this traditional substrate. Closet organization units – presenting efficient and stylish closet systems, storage cabinets and shelving systems for clothing, shoe, laundry, pantry and general home or business organization. And we provide it all with quality materials and craftsmanship, experienced design and installation, and efficient and responsive service. 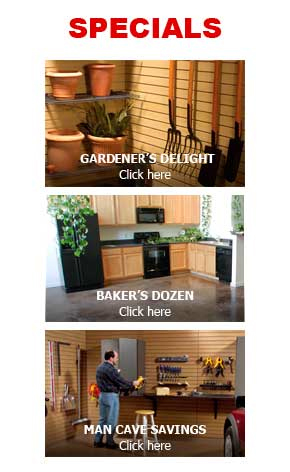 Get a completely custom look you won’t find at any home improvement store and get it at an affordable price. For a free estimate and design plan call us today at (937) 623-3036.